You must be a member of the Antalya Outdoors & Adventure Sports Group to attend this activity. Would you like to join this group? Let's go skiing for a day! - We shall meet there. - Feel free to talk to each other regarding rides. -I will not go if it rains or if it is stormy. 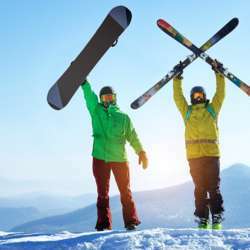 -I am a lazy and bad skier so feel free to build groups according to your skill and liking. -If you take the bus - please let me know - you will get there later - so I will announce a meeting point to gather for approx. 11am.